A relaxed walking holiday that is based in the charming town of Gravedona on Lake Como. Enjoy easy walking on the network of footpaths linking the many villages nestled in the mountains around the lake and along the shore. Stay in a family-run hotel with swimming pool spectacularly located right at the water's edge. The trip starts at the terminal 2 arrivals hall of Milan Malpensa airport from where it's around a one-and-a-half to two hour drive to our lake-side hotel in Gravedona, our base for the next seven nights. The town is a jumble of pastel-coloured houses set against the deep blue of the lake and has a few shops, cafés and restaurants. Our small hotel is family-run with a lake-side swimming pool and stunning views across the lake to the surrounding mountains. The hotel is an 800 metre, ten minute walk from the town centre. Our time in Gravedona promises to be a quintessentially Italian experience, with friendly people and restaurants serving classic Italian dishes and fish from the lake, including the local specialty of fish risotto. Long-associated with poets, artists, world leaders and, lately, film stars, Lake Como is undoubtedly the most beautiful of all the well-known Italian lakes. The Southern Alps - which are still snow-covered until May - surround the lake which is dotted with small harbours, stately villas and traditional towns. Our first walk takes us high above Lake Como offering fabulous views and a good orientation of the region. We hike from the hotel, through villages and then into a thick forest. Near the village of Livo is a deep cleft in the ground that is the boundary between the African and European tectonic plates. After two-and-a-half hours we reach Livo, located 430 metres above the lake: it feels remote and very different to the lake-side villages. A little on from Livo there is the 15th century church of San Giacomo standing way above the impressive Valle de Livo. After a picnic lunch we descend back through the forest to the hotel via a different route. Today's 12 kilometre walk is expected to take approximately six hours with a total ascent and descent of 430 metres. Our walk today is once again direct from our hotel and is a seven kilometre traverse from Gravedona to the village of Sorico, located on the north-west shore of Lake Como with an impressive church. We pass through the pretty town of Domaso and then slowly climb up through meadows, vineyards and chestnut groves to the ancient village of Aurogna. Our views are of the high Alpine peaks that straddle the border between Italy and Switzerland. At Sorico we have a picnic by the lake. We then either take a short bus ride back to the hotel or walk along the newly-constructed path that contours along the lake shore. Today's seven kilometre walk is expected to take approximately three to four hours at a leisurely pace with an additional one-and-half hours if you choose to walk the seven kilometres back to the hotel from Sorico. Today's total ascent and descent is 210 metres. We take the bus south along the lake to Menaggio - a small town with a pretty piazza - from where it's a short ferry ride across to Bellagio on the eastern shore. From the ferry you can see the fabulous lake-side villas that have been host to royalty and world leaders. Bellagio, often described as the 'Pearl of Lake Como', is charming with cobbled lanes, boutiques, cafés and two gardens you can visit. You can either chose to spend the day exploring the town or head up on a bus to Civenna from where we walk on a ridge over-looking the lake back to Bellagio. The route takes us through pretty forests, passing isolated farms and villas with wonderful views of the lake. 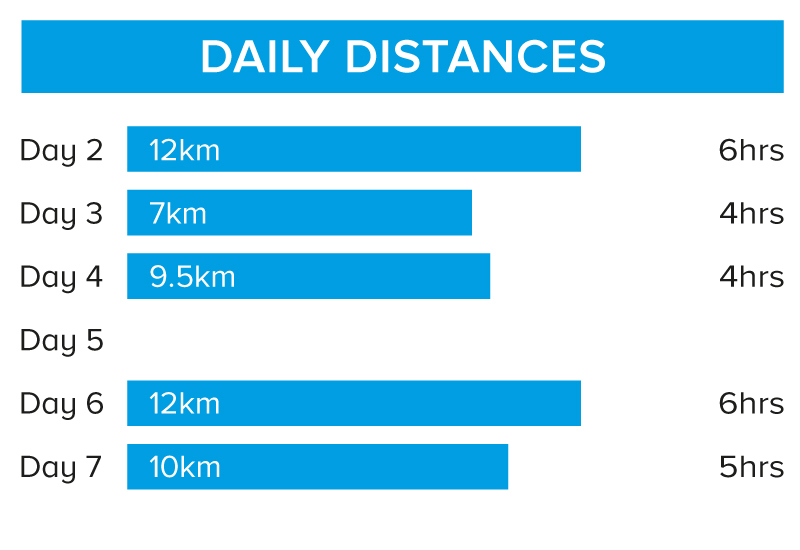 Today's nine-and-a-half kilometre walk is expected to take approximately four hours with a total descent of 400 metres. Today has been left free so that you can explore parts of the area that interest you the most. Close to Menaggio is the impressive Villa Carlotta with stately rooms and manicured gardens that are well worth seeing. Como town can be reached by ferry or public bus in 90 minutes: the old town has many churches, piazzas and museums together with lots of shops, cafés and restaurants. There are also boat tours from Menaggio that take you past the many villas along the lake shore. Today is a wonderful walk with outstanding views across the lake to Bellagio. We take the bus to Croce and head up a zig-zag path to the chapel of Madonna della Grazie di Paullo. Further up we reach a mountain pass with panoramic views of the lake. We then descend to the town of Griante and on to Cadenabbia, located on the western shores of Lake Como. Our return to Gravedona skirts along the side of the lake by local bus. Today's 12 kilometre walk is expected to take approximately six hours with a total ascent and descent of 550 metres. For our final walk, we take the 20-minute bus ride to Rezzonico which has flights of cobblestone steps, a beautiful harbour and a 13th century castle. It is one of the few lakeside villages to have maintained its original structure. From here we climb above the lake through vinyards and orchards leading to a succession of pretty hamlets along today's 10 kilometre walk. The trail gently undulates through more villages and farmland with fabulous lake views. Towards the end of the walk, we arrive at the magnificently situated church of St Eufemia. Our destination is Dongo where Mussolini was caught in 1945 whilst trying to escape to Spain. The war museum is well worth the visit. We take the five-minute bus back to Gravedona or you can walk in around one hour. Today's gently undulating 10 kilometre walk is expected to take approximately five hours. 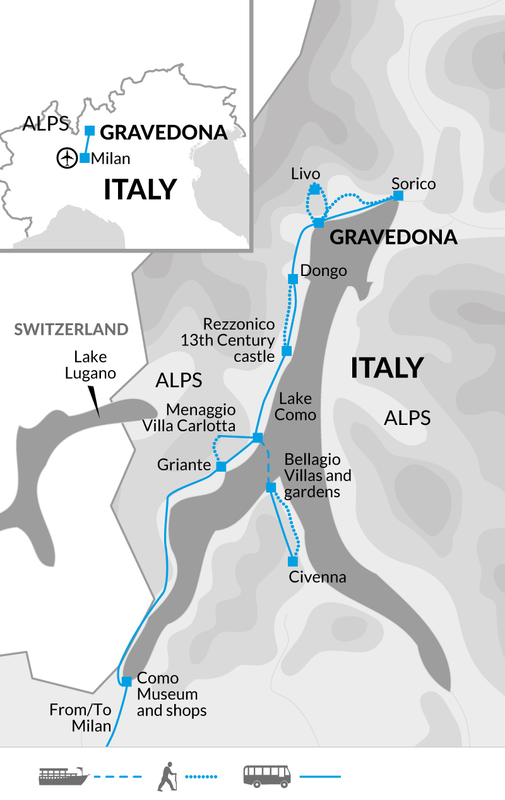 From Gravedona it is around a one-and-a-half to two hour drive to Milan Malpensa airport where the trip ends at terminal 2. Visit Villa Carlotta near Menaggio (30 minutes away from Gravedona by public bus) - Entrance ticket is €9 or €7 for over 65s. Return bus fare is €6. Private boat tour from Menaggio of the lake-side villas - €20 for 60-90 minutes. Return bus fare Gravedona/Menaggio is €5 and takes 30 minutes. Como town - The direct boat from Gravedona to Como Town is €12.60. Return is €25.20. Add another €4.90 each way for the express service (slow takes 2 hours / express 1.30 hours).There is also another boat ticket that costs €28 and allows you to get on and off ferries when you feel like it (so you could do Gravedona, Menaggio, Bellagio and Como by boat in one day!). The public bus takes 1.45 hours from Gravedona to Como town and costs €7 each way. You have to change bus at Menaggio - there is a 5-7 minute window to change bus. Take light and comfortable clothing that can be layered according to the temperature. Rainwear (e.g. Gore-Tex jacket and waterproof trousers) may be needed at any time of year, and a warm fleece/jacket is needed for cooler days and evenings, particularly in April and October when it can sometimes get quite chilly in the evening. A refusable water bottle, sunhat and high factor sunscreen are all essential. A torch is useful in case of power cuts or emergencies and a lunch box/Tupperwear for picnic lunches. Family-run Hotel Regina occupies a prime position on the shore of Lake Como and is just a 10 minute scenic walk from the restaurants and shops of laid-back Gravedona. After a day's walking, it's the perfect place to relax and enjoy the inspiring lake and mountain views from the bedrooms, breakfast room and bar. Or take advantage of the stunning panoramic solar heated swimming pool. All rooms have private attached bathrooms. There's also a small gym, mountain bike rental and free Wi-Fi. All double occupany rooms will enjoy a lake view. For single rooms this will be subject to the availability at the time of the trip. We walk on 5 days with an average of 4 to 5 hours each day. Most of the walking is on well maintained footpaths between the villages around Lake Como. This trip is based at the family-run Hotel Regina which occupies a prime position on the shore of Lake Como and is just a 10 minute scenic walk from the restaurants and shops of laid-back Gravedona. After a day's walking, it's the perfect place to relax and enjoy the inspiring lake and mountain views from the bedrooms, breakfast room and bar. Or take advantage of the stunning panoramic solar heated swimming pool. All rooms have private attached bathrooms. There's also a small gym, mountain bike rental and free Wi-Fi.